Let's talk about the Silver Age of comics and the recent spate of collections from that time-period, as well as the Golden Age. DC Comics has finally decided that their vaults are no place for some of the best comics produced during the 1940s, '50s and 60s, so they have brought them out into the light of day and cleaned them up for everyone to consume. 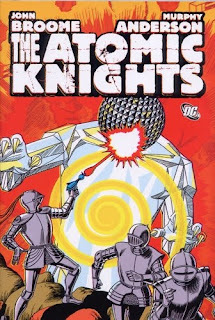 That is why we have gotten collections of the earliest Superboy stories, Jack Kirby and Joe Simon's Newsboy Legion, and now this, Atomic Knights! After being teased for the last decade that DC would finally collect the sixteen stories from John Broome and Murphy Anderson's premiere team, Atomic Knights, DC finally released this in hardcover. Of course, we had expected them to collect it in the Showcase Presents format, along with the Hercules Unbound stories and the like for The Great War collection that was promised years ago, but instead they decided to concentrate on just presenting the tales of Gardner Grayle and the gang from 1960 through 1964 appearances in Strange Adventures (a wonderful anthology that DC is presenting from the early days in a Showcase Presents volume before the Knights were introduced). The issues we have in this volume are Strange Adventures #117, 120, 123, 126, 129, 132, 135, 138, 141, 144, 147, 150, 153, 156 and 160. In the early 1960s, most Americans feared nuclear holocaust, especially after the events of the Cuban Missile Crisis. This fear forms the basis of Broome and Anderson's Atomic Knights stories. In the days after the Great War, after the last H-Bomb exploded and left humanity without adequate food, water or shelter, the book finds Gardner Grayle and schoolteacher Douglas Herald protected from a bomb attack by six suits of medieval armor. Finding that all technological weapons are useless against these irradiated suits of armor, Gardner decides to form a band of knights to foil the despotic local leader, The Black Baron. This became the Knights primary mission -- fighting ruthless despots throughout America to get communities back on their feet and thriving. Grayle completes the Knights with Hollis and Wayne Hobard, two farmers, a scientist named Bryndon (science caused the weapons of the Great War, so scientists are for the most part considered evil here except Bryndon), and finally Marene, Douglas's sister. Marene is used as a backup in most stories, since this was the 1960s and women were treated not truly as equals especially in the military, so Broome made a point of catagorizing the sixth suit being too small for a man to use. The villains of the story include the reoccurring Khagan of Atlantis, and then one-off appearances by cavemen from below New York City, electrical giants created from mutant brains, mutated plants that walk, aliens looking to be our overlords, mole-men (my favorite because they can only fight you at night), a King of New Orleans who has his city hypnotized, and the marauding Wild Boys. 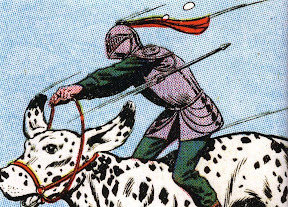 One of my favorite parts was when the Atomic Knights, while fending off an attack by Khagan, find a crashed spaceship containing giant dalmations, which they (naturally) harness to use as horses. Basically, these are great stories and should be appreciated by everyone who reads them. My review would be all positive except for two things: the paper quality and the use of bad art for the cover. The lower quality of paper is to DC's shame: they can do trade paperbacks in a slicker quality and even make other hardcovers use the good stuff (Starman Omnibus), but they use newsprint for a book that collects these timeless classics. At $39.99 for this volume, I'd think some of that money could go toward paper that's not so cheap! My other complaint about the bad art is not a dig at the wonderful Murphy Anderson. No, it is a dig at the fact they used a small image of Gardner on a dalmatian and blew it up to 500 times its original size for the back cover. And instead of the wonderful line-work of Anderson, you get huge lines that make the image look like a poor imitation of his work instead. DC could have used images from other panels or maybe even the cover of Strange Adventures #144 with the Knights and those wonderful Mole-Men. Heck, if they had to, DC could have used art from someone current as a re-interpretation. But instead, they used that one poorly reprinted panel to represent some of the best sci-fi stories that ever appeared in comics. Overall, I can honestly say that this Atomic Knights volume is one of my favorite books that DC has produced. My memories of these stories are great and seeing them in this one book made me so happy, I have read it three times since I got it in August. Paper and cover aside, this is a wise investment as well as an interesting one. I could never get over the dalmation thing. I can't decide if it's the saddest thing ever or the coolest thing ever. Good review! Todd, solid work. I've been curious about this one since I think the omnibus collection is a great idea for DC, and online retailers like Amazon really make these affordable. Based on the typography of the cover and the way you describe the paper quality (which I actually don't mind, since it makes me feel like I'm reading the original single issues), it sounds like this is assembled the same as the recent four-volume Kirby's Fourth World set. The reason I ask is because I have a bigger question about the quality of the reproduction here. The Silver Age Kirby stuff that's been put in omnibus format - Fourth World, OMAC, Losers, The Demon (where's Kamandi, DC?) - has really high-quality reproduction; the colors are vibrant, the lines sharp, and the lettering retouched for clarity. Unfortunately, I got burned on Kirby's Golden Age work in omnibus - Newsboy Legion and Sandman - since it looks like DC just scanned the images using a red light bulb; all the artwork is fuzzy and has an ugly red hue over everything, such that I haven't even read these two because it just makes me angry. Is this collection polished up like the Silver Age Kirby stuff? That's the make-or-break on this one for me; your review suggests the book knocks it out of the park, which is great because I love Silver Age sci-fi like this, but if the production value isn't a little higher I'm just not shelling out the money for this one. PS - that exaggerated line art? It seems to be DC's omnibus "style." It's on every Kirby volume, and underneath the jacket it's even more apparent. No idea why anyone would prefer the actual cover to the slipcover, but to each his/her own.